ANNVILLE, Pa. (Nov. 17, 2015) – Senior captain Brandon Jones (Baltimore, Md.) headlined a list of 13 Widener University football players who earned All-Middle Atlantic Conference postseason recognition, as announced by the league office on Tuesday morning. The defensive lineman was named the conference's defensive player of the year. Jones was also named to the All-MAC First Team along with fellow senior defensive linemen Shakore Philip(Bay Shore, N.Y.) and Stacey Sunnerville (Freehold, N.J.), senior offensive lineman Stephen Domonoski(Egg Harbor Township, N.J.) and senior fullback Robert Getz (Kunkletown, Pa.). Second team honorees included senior defensive back Travon Barnes (Randallstown, Md. ), junior linebacker Steve Gozur (Hatfield, Pa.), senior kicker Ryan O'Hara (Royersford, Pa.), junior wide receiver Blaine Price (Jefferson, Md. ), and sophomore special teams player Alex Stewart (Pittsgrove, N.J.). Junior wide receiver Max Kutler (Cranbury, N.J.), freshman punt returner Jake Parola (Medford, N.J.) and senior wide receiver Philip Ragona(Oceanside, N.Y.) garnered honorable mention status. Jones became the second straight Pride player to land defensive player of the year accolades after linebacker Brandon Harper achieved the honor in 2014. The senior concluded the regular season ranked sixth nationally in sacks (12.5), 14th in tackles for a loss (19) and 28th in forced fumbles (3). His best game was in the team's 40-10 rout of Misericordia when he recorded seven tackles, including four solo, along with 3.5 sacks and tackles for a total loss of 28 yards. Philip and Sunnerville joined Jones on what was arguably the most formidable pass rush in the nation. Sunnerville ranked fourth in the country in sacks (13) and third in tackles for a loss (21.5), while Philip had 3.5 sacks and 13.5 tackles for a loss. Sunnerville also put together one more of the most impressive single-game defensive performances in recent memory by registering 11 tackles totaling 22 yards for a loss along with five sacks and a forced fumble in a road win over Wilkes. The trio of Jones, Philip and Sunnerville have helped Widener rank third nationally in both sacks and tackles for a loss this fall as well as eighth in total defense. Domonoski and Getz led a Pride offense that ranked first in the league with 412.7 yards per contest. 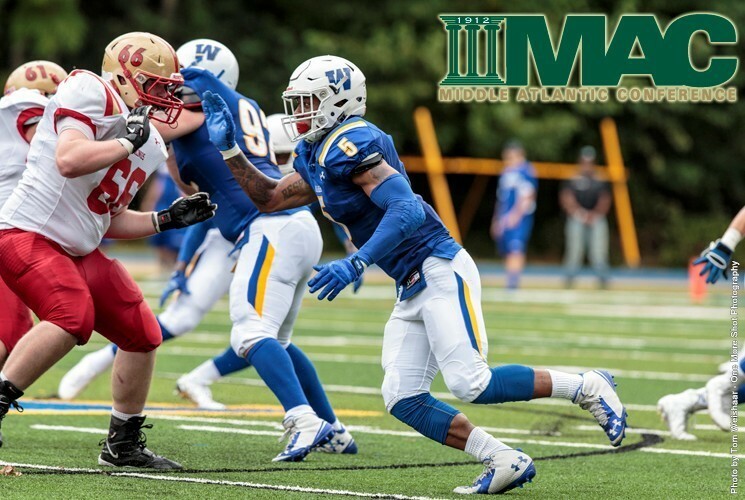 Domonski headlined an offensive line that allowed Widener's quarterbacks to connect with wide receivers for a league-best 308.2 passing yards per game and opened up holes for fullbacks like Getz, who logged 104 rushes for 449 yards and 10 touchdowns. Getz most notably reached paydirt three times against King's and Misericordia. O'Hara, who also accepted punting duties for the last four games, was one of the most productive kickers in the country this fall. He averaged 1.6 field goals per game, which ranks second nationally, and was 10th in Division III for converting 80 percent of his attempts. A two-time Capital One Academic All-District selection who is currently eligible for Academic All-America laurels, O'Hara had at least two field goals in six games and concluded the season with a 52-yard boot in the season finale at archrival Delaware Valley. Like the three defensive linemen, Barnes and Gozur played a huge role in making Widener tops in the league in total defense. Barnes finished the year with 32 tackles, including four for a loss, along with two interceptions and Gozur added 71 tackles and two forced fumbles. Price and Stewart rounded out the list of second team honorees. A Capital One Academic All-America candidate like O'Hara, Price ranked third in the league with 93.9 yards per game along with seven touchdowns over eight contests. Stewart had 14 tackles and 1.5 sacks. Kutler and Ragona teamed with Price to form one of the top wide receiver tandems in the conference. Ragona averaged 71.1 yards per game, Kutler contributed 51.6 yards and both players caught balls in the end zone five times this fall. Rounding out the list of all-conference honorees for the Pride is Parola. The team's lone freshman honoree led the conference with 347 yards on punt returns, which was nearly double the yardage of anyone else in the league, and averaged 9.9 yards per return. Parola's longest return came when he bolted for 61 yards to set up a touchdown in a 48-7 rout of Lycoming on Halloween. Widener (6-4, MAC 6-3) registered its fifth straight winning campaign and sixth consecutive with a .500 or better record in 2015. The team ended the season ranked first in the league in total offense and defense.